Having had a valuable title of a “Living Heritage Treasure of Penang” bestowed on him, Mr. Sim Buck Teik is the owner of Seang Hin Leong on Beach Street. Now in his eighties, Buck Teik no longer works full time, but he still spends most of his day at the shop. He loves sitting in his shop facing the street, where he can enjoy the breeze gushing in. His shop is being prolonged by his son and daughter, Mr. Sim Hin Leong and Ms. Sim Jeck Choo. Buck Teik learnt his craft techniques from his father, in his home district of Teochew in China, before the family moved to Malaya (how Malaysia was referred to in that era). At the shop, the Sims work with rattan and bamboo, making them into furniture and household objects. They are all highly skilled in rattan weaving and is capable of weaving in all shapes and sizes demanded by their customers. 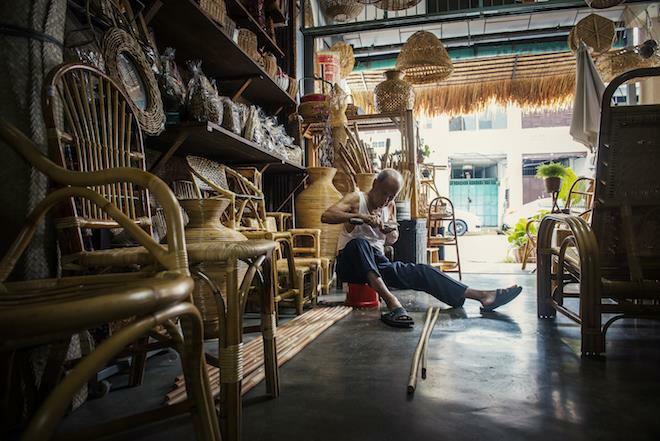 At Seang Hin Leong, they are specialised in making customised items and doing repairs on an old object. 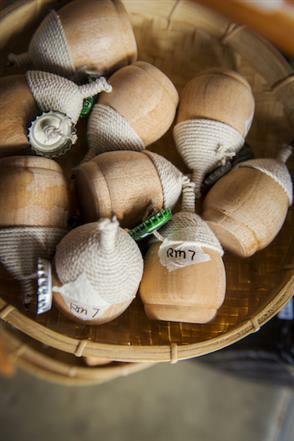 Other than producing objects for sale, they also run rattan weaving classes for tourists at a reasonable price of RM80. Other than items made in-house, the shop also sells ready-made products from China, Indonesia and Singapore. Business these days are considered low compared to when demand for rattan products was high. Despite this, the Sim family is still determined in growing their business and passionate as ever in rattan weaving. 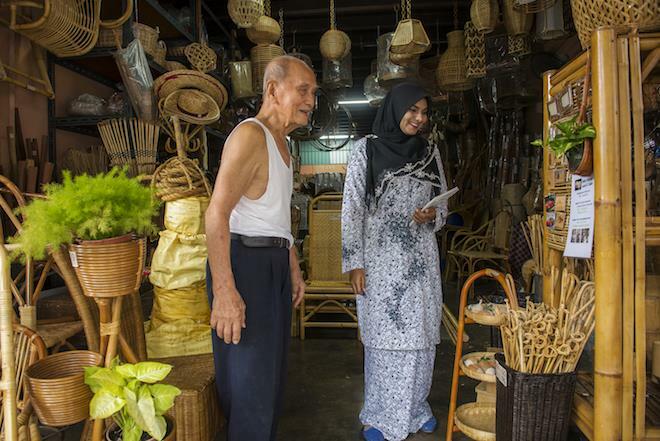 Most of their rattan supplies are taken from Pahang. Rattan is known for its durability but if it’s not treated the right way, it will come out as fragile. Furniture and any other products made by rattan are proved to be robust. Prior to any weaving, they must be soaked in water, increasing the flexibility of each rattan so that it does not break when it’s bent. When the rattan dries, it will become tighter and sturdier. As certain parts of the rattan can be sharp and could cause hurt, it is important to make sure that its surfaces are smooth and parts with black marks are not sticking out. 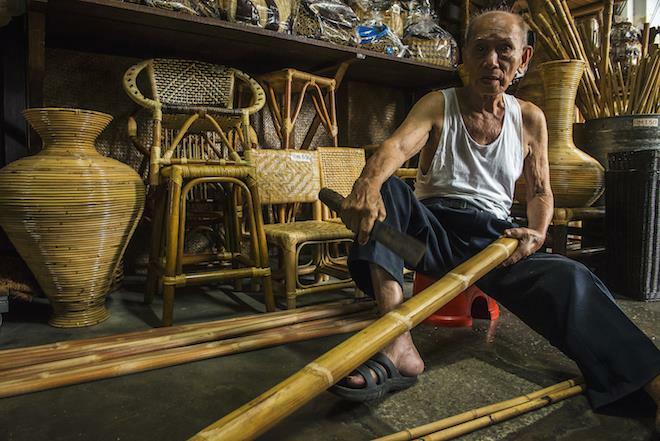 Buck Teik will smoothen the rattan with a knife, and double check by rubbing his hands across the rattan, making sure that it’s smooth. Buck Teik is good at weaving small items. 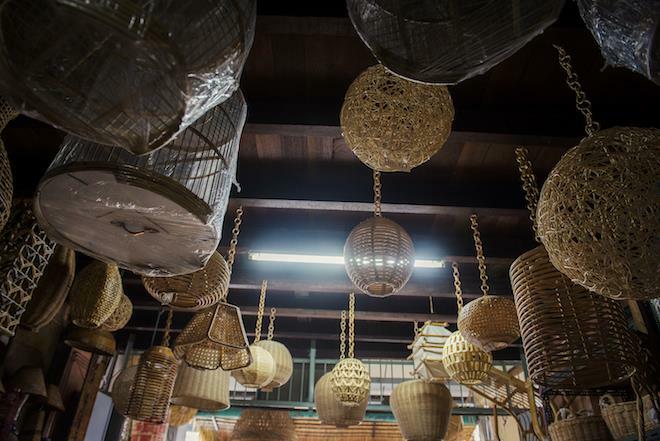 The products they make ranges from furniture to unique items such as handbags made using rattan. Smaller products like decorative items could take them up to one day to complete, and a furniture can take a few days, depending on its size. Majority of the customers at Seang Hin Leong are locals. Prices at the shop are fixed, with a price tag pasted on each of their items. 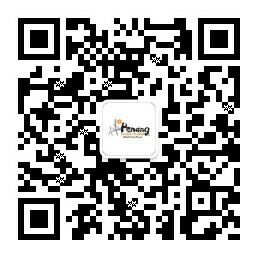 Other than rattan products, souvenirs such as keychains, fridge magnets, wooden spoons etc are also sold. Having run his business here all these years, Buck Teik adores the environment around him and he is grateful that the road has remained at its quiet pace, allowing his customers to be able to park when visiting his shop. On top of everything else, he is extremely pleased that his children has taken after him with a passion in rattan weaving and is working hard in growing and prolonging this brainchild of his.